The unfolding Petraeus scandal is like a trashy book. This chapter is focused on the Kelley’s “charity” which should raise important questions for the IRS and Florida authorities. Jill Kelley is the 37-year-old woman who became the target of allegedly threatening e-mails from Paula Broadwell that led to the investigation of an alleged extramarital affair between Broadwell and the ex-CIA chief, retired Gen. David Petraeus. Although Broadwell was apparently suspicious that Kelley was sexually involved with Petraeus this does not seem to be accurate. But now Kelley has become a story herself as a Tampa, Fla. area “socialite” known for buddying up with the military, including through e-mail correspondence with the top NATO commander in Afghanistan, Marine Corps Gen. John Allen. E-mails from Allen to Kelley have been described as somewhat or very flirtatious. Variously described as a “military hostess” or an “unpaid social liaison to MacDill Air Force Base,” several news sources have reported that Kelley paid for some of her “fancy parties with expensive cigars and buffets of expensive caviar” with money raised for a purported anti-cancer charity that she founded with her husband, Scott, who is a doctor. According to the Huffington Post, the Doctor Kelley Cancer Foundation was bankrupt by the end of 2007, having spent all of the $157,284 the nonprofit started with. Press reports say that the foundation was established in 2007, though the foundation’s articles of incorporation were filed with the Florida Secretary of State on December 29, 2005. 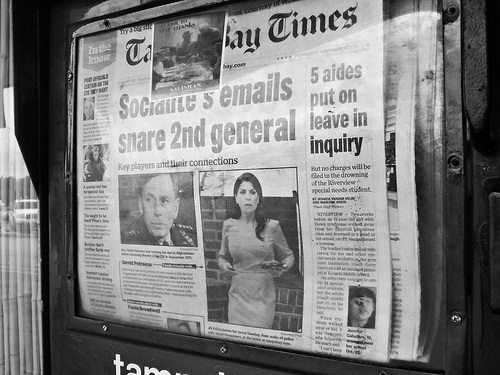 Public records show that it applied for reinstatement as a not-for-profit corporation under Florida state law in late 2006, suggesting that the entity may have been largely inactive during its first year of existence. The foundation was able to show $157,284 raised and spent in 2007 without explaining where the money came from, though $37,481 of the total was spent on fundraising—and an additional $61,386 on management and administration. Pardon us for arching an eyebrow. Given other charitable problems in Florida that escaped state attention recently, such as the lack of action on the dubious charity established by the parents of Caylee Anthony, we aren’t all that surprised to see no indication that the state was looking into the unusual expenditures constituting the organization’s services or expenditures. Maybe if state officials had linked the Kelleys of the cancer foundation with the Kelleys who were being sued by multiple banks who claimed they were owed debts by the Kelleys that would collectively total in the millions, that might have sparked some interest. No offense to the military, but what does someone do as an “unpaid social liaison” to a military base, presumably an activity that would be classified as volunteerism? How does a charity suddenly show up with over $157,000 in assets, spend it all out in one year, go bankrupt, with a very visible socialite in charge, and no one with the authority to do something takes note and asks questions?